EC Montreal’s Muscle Training Session! Yesterday afternoon, EC Montreal students had the opportunity to get a free fitness class from a professional trainer. Danae Pasarell is a fitness expert who trains daily. She was kind enough to come to EC Montreal to offer a free workout to our students! The muscle training class lasted 30 minutes. We were motivated by Danae’s enthusiasm and energy! Her song playlist was very popular among our students. They all had so much fun! She took the time to speak to the students after the class about the importance of exercise and physical fitness. As January’s calendar of events has a New Year’s resolution theme, diet and exercise are among people’s top priorities at the start of the year. We hope this motivation will last all your long and beyond! 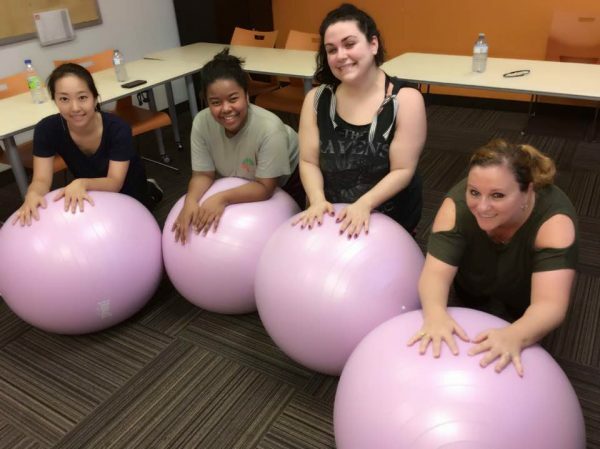 This fitness class is only one of many free social activities we offer weekly to our EC Montreal students. Next Wednesday, we will host a salad bar activity where students can build their own salad bowls with a variety of fresh ingredients. Join our ESL courses in Montreal.